This page of swimmers feature guys who are almost all 6'3" (1.9m) including Steven a Polish male model I photographed in Hollywood splashing in my hot tub. Pointlessly handsome he is! He is not a swimmer, is not swimming, but is clearly wet. And that's good enough for this gallery. At left is Rafael Muñoz Pérez (born 1988 in Córdoba) a 6'3" (1.9m) Olympic swimmer from Spain. He competed for the Spanish Olympic team at the 2008 Olympic Games. 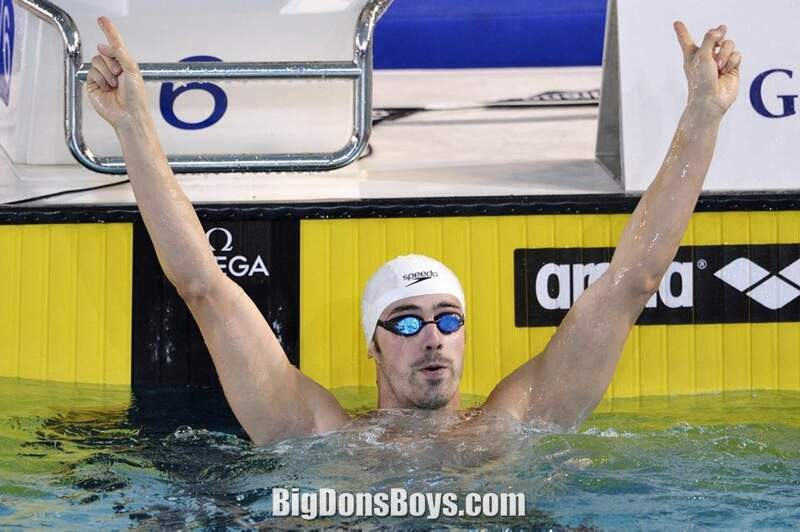 On April 5, 2009 at the 2009 Spanish Championships, he swam a 22.43 in the long-course 50 butterfly, going under the existing World Record of 22.96 by South Africa's Roland Schoeman. This time, however, it was not recognized as the world record until the 22nd June, when the governing body of aquatic sports, FINA, finally accepted the controversial swimsuit he and many other swimmers had been wearing as they achieved such times. 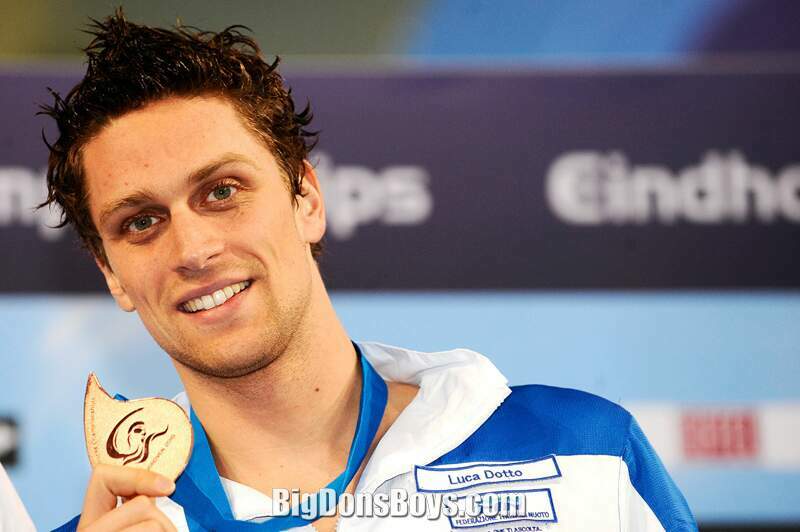 Luca Dotto (born 1990) is an Italian freestyle swimmer and is among the fastest sprinters in the world at the 50m and 100m distances. 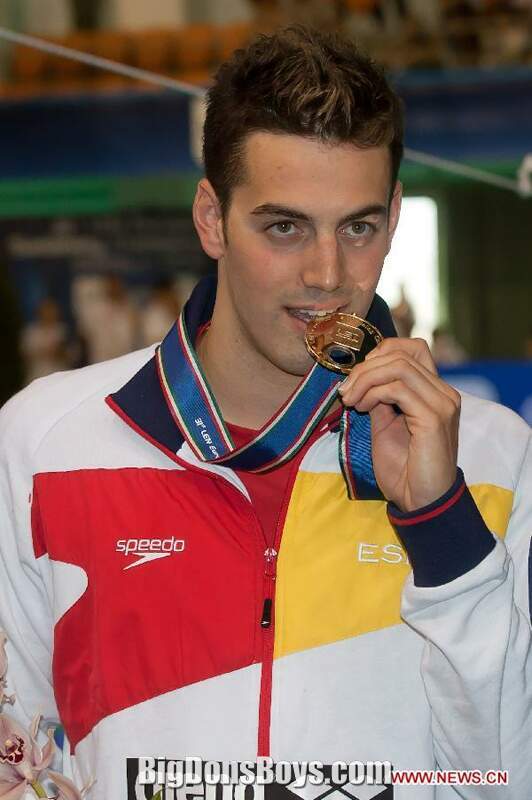 Luca’s debut on the international stage came as part of the Italian junior squad at the 2006 Comen Cup (now the Mediterranean Swimming Cup) in Rio Maior, Portugal, where he won a 50m freestyle silver medal and a 4x100m freestyle gold. 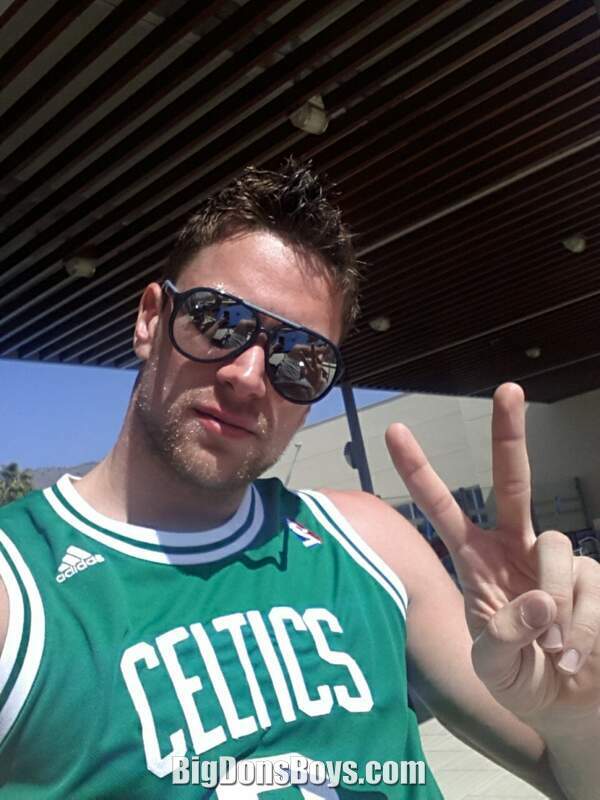 As a junior he went on to win 50m freestyle bronze at the 2007 European Junior Championships in Antwerp, and a 50m freestyle gold and 4x100m freestyle relay silver at the same championships a year later in Belgrade. Also in 2008 he came home with an impressive haul from the FINA World Junior Swimming Championships in Monterrey, winning gold in the 00m freestyle and 4x100m freestyle relay, and the 50m free silver. 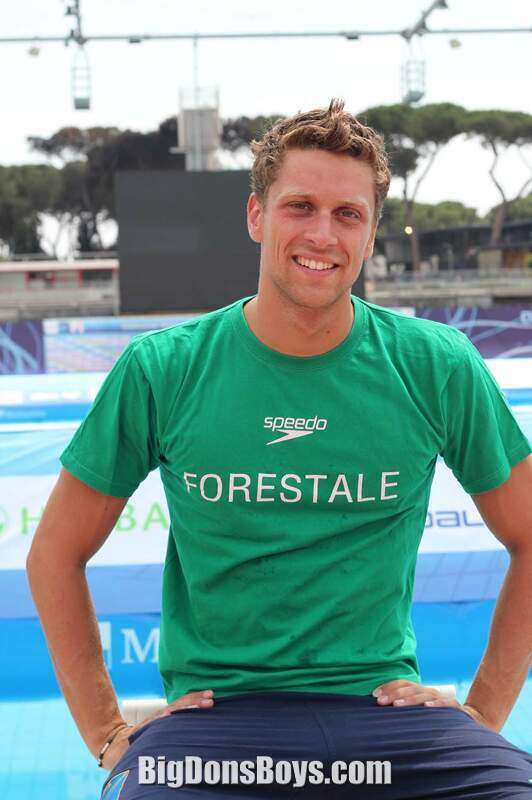 Dotto started 2009 with a flourish as he shattered Giorgio Lamberti’s 20-year-old Italian 00m freestyle record at the national spring championships (49.22), only for it to be broken in the next heat by relay teammate Marco Orsi (49.3). Luca, however, came back to win the title in the final. 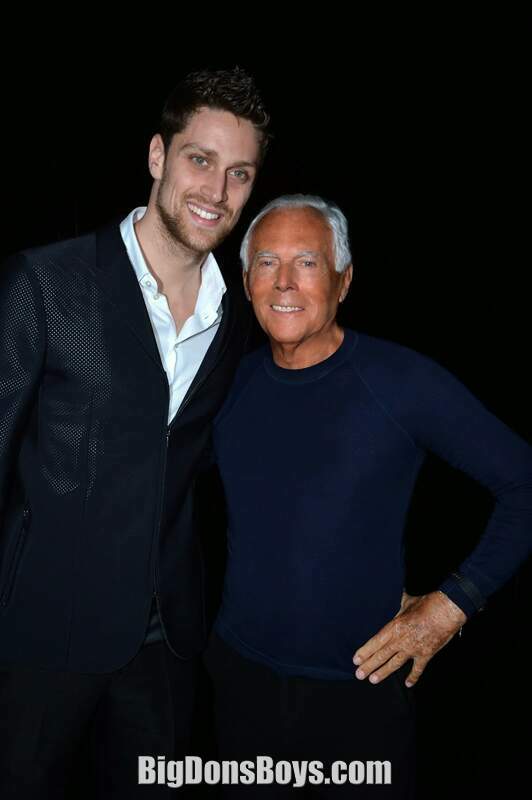 Later that year at December’s European SC Championships, he made his senior debut as a member of the third-placed Italian 4x50m freestyle relay team. 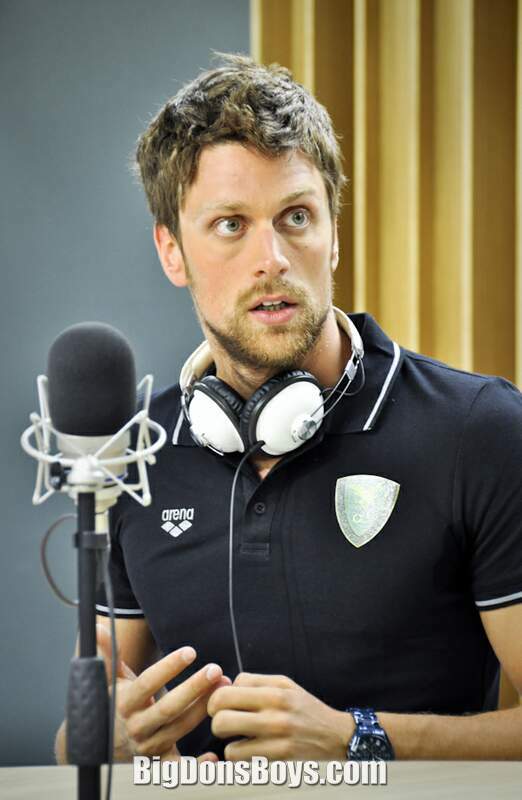 In 2010 Dotto moved to Rome to train with fellow sprinter Filippo Magnini, joining the Gruppo Sportivo Forestale (State Forestry corps of the Italian police force). 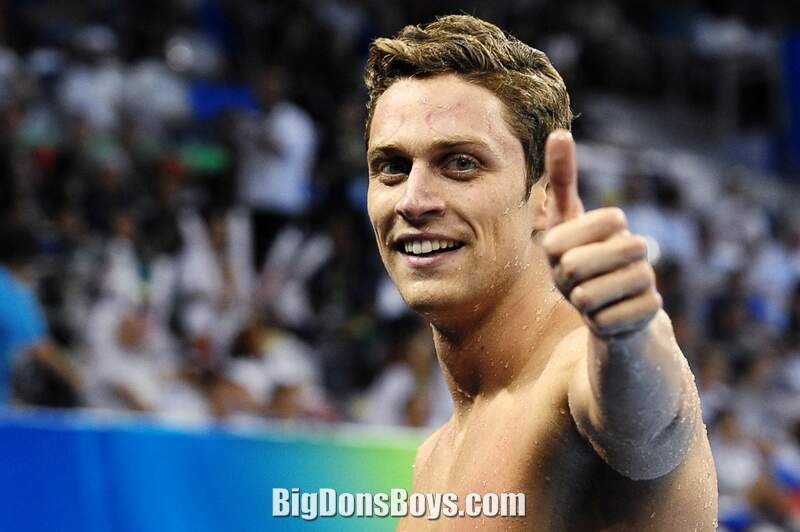 Later that year he made his European LC Championship debut, making both the 50m and 100m freestyle finals. In both the 100m heats and semi-finals, he became only the second Italian to swim below 49s in a textile suit, and in the 50m free final swam the second-fastest textile time in Italian history (22.4). Three months later at the European SC Championships in Eindhoven, he won his first senior international gold medal (4x50m freestyle relay) and his first individual medal, a bronze in 00m freestyle. Three weeks later at the World SC Championships in Dubai, he made the final of both 50m and 100m freestyle, becoming only the second Italian to swim a sub-47s 100m in both the semi-final and final. In the 4x100m freestyle relay, he was part of the Italian team that broke the Italian national mark in both the heat and final. Three days after leaving Dubai, Dotto earned his first Italian national titles, winning both 50m and 100m freestyle in Riccione. Like 2009, Dotto started off 2010 impressively, winning both the 50m and 100m freestyle national titles, swimming the fastest-ever Italian 50m free in a textile suit. But it was at the World LC Championships in Shanghai that he came of age on the international stage, winning the silver medal in the 50m freestyle dash. 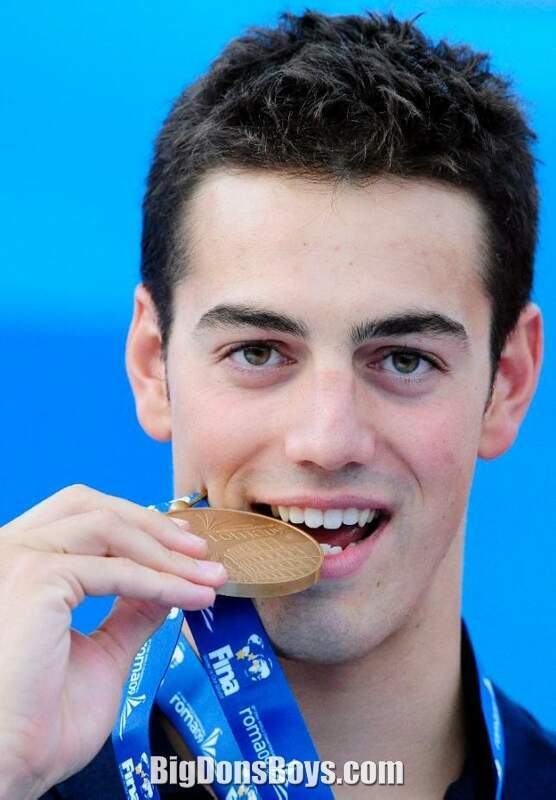 He also made the 100m freestyle final, and was part of the Italian 4x100m freestyle relay team that finished fourth. Luca ended off the year with a 4x50m freestyle relay gold medal and a 100m freestyle silver at the European SC Championships in Szczecin. 2012 promised optimism after Dotto’s Shanghai silver, but a back injury severely hampered his Olympic training program, and ultimately his London Games was disappointing by his standards, failing to make the 50m freestyle final or the 00m free semi-final, and finishing seventh in the 4x100m freestyle relay. However, signs of a return to form emerged later in the year at the European SC Championships in Chartres (where he swam a strong 00m freestyle final), and the World SC Championships, where the Italian 4x100m freestyle relay team got back to their medalling ways with a silver at the World SC Championships in Istanbul. 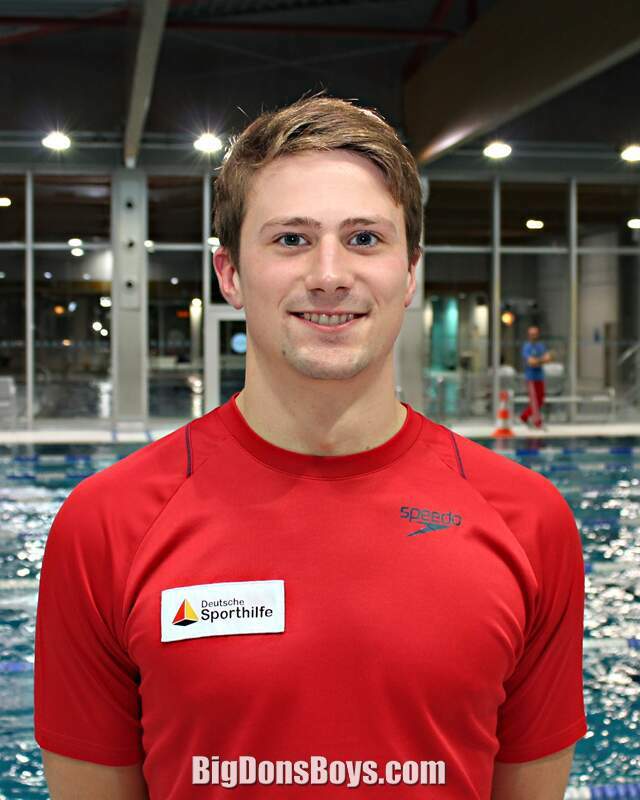 Christian Vom Lehn (born in 1992) is a German swimmer specializing in the breaststroke. Little else is known other than the fact that he isn't marketing himself. 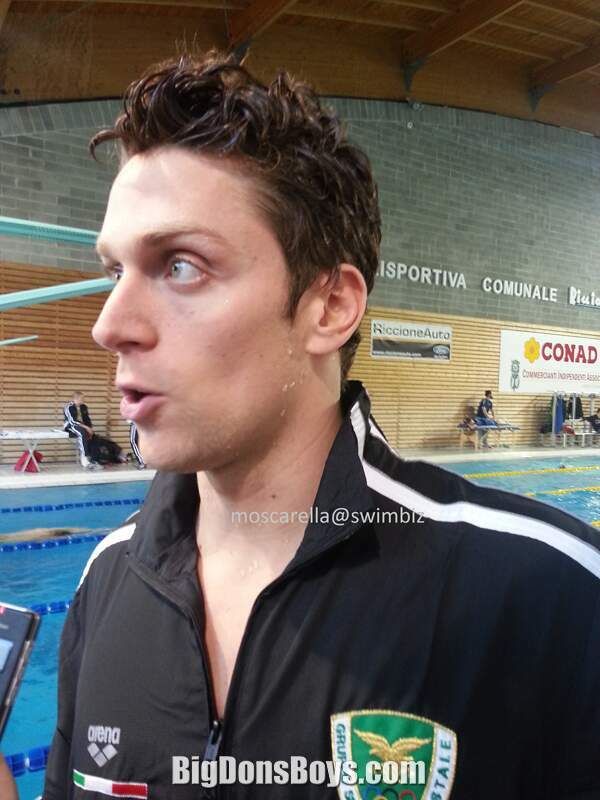 Davie Nadadores interviews Italian swimmer Luco Dotto in rapid fire silly manner I totally approve of. Dotto was a silver medalist in the 20 Shanghai World Championships 50 meter freestyle. The swimmers he interviews playfully "go for it."